Heat oven to 350°F. Spray 6 miniature Bundt® cups generously with nonstick cooking spray. Place 1 tablespoon orange juice concentrate in each sprayed cup. Sprinkle evenly with cranberries and walnuts. Place melted butter in shallow bowl. In another shallow bowl, combine sugar and cinnamon. Separate dough into 8 biscuits. Cut each biscuit into 3 wedge-shaped pieces. Dip each biscuit piece in butter; lightly coat with sugar mixture. Place 4 biscuit pieces, point side down, over mixture in each cup; press lightly. Drizzle any remaining butter evenly over rolls. Bake at 350°F. for 18 to 23 minutes or until golden brown. Invert pan onto serving platter or cookie sheet; leave pan over rolls for 1 minute. Carefully remove pan. If any topping remains in pan, spoon over rolls. Serve warm. To prepare in 12x8-inch (2-quart) glass baking dish, generously spray with nonstick cooking spray. Place orange juice concentrate in bottom of dish. Sprinkle with cranberries and walnuts. Prepare biscuit pieces as directed above. Place biscuit pieces, flat side down, over mixture in pan. Bake at 350°F. for 20 to 23 minutes or until golden brown. 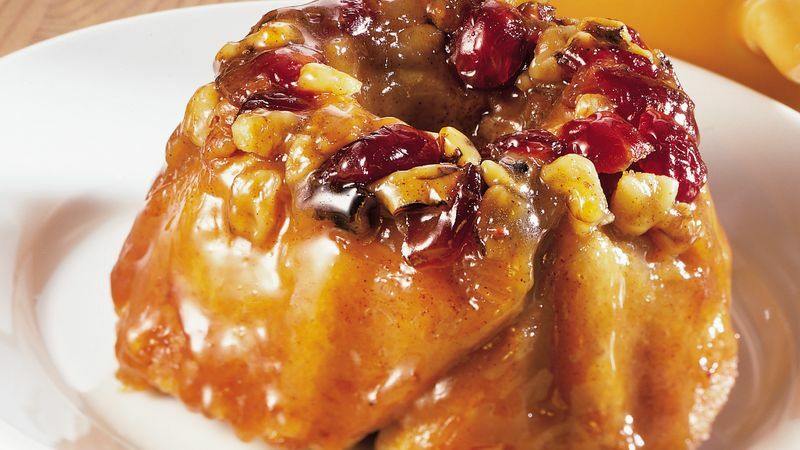 To prepare in 12-cup Bundt® pan, generously spray with nonstick cooking spray. Place orange juice concentrate in bottom of pan. Sprinkle with cranberries and walnuts. Prepare biscuit pieces as directed above. Place biscuit pieces, rounded side down, over mixture in pan. Bake at 350°F. for 23 to 33 minutes or until golden brown. ®Bundt is a registered trademark of Northland Aluminum Products, Inc., Minneapolis, MN.